La Grosse Forge is the place to relax and do your own thing.! The house has three bedrooms, two bathrooms with showers and baths. It can sleep 5/6 people and we have a cot and high chair. There is a spacious well equipped kitchen with dishwasher, fridge freezer, microwave, Senso Coffee machine. A comfortable lounge.There is a play area for children with lots of toys and books. Garden furniture,Bar-B-Q , Sun Parasols , sun loungers and a Fun Pool. All towels,tea towels and sheets are provided along with towels for the beach. Ample secure parking. Happy holiday. We bought La Grosse Froge as a holiday home. We wanted the freedom that it offered ,get up when you want , eat when you want, and generally relax at our own pace. The pretty garden full of wildlife, and long sunny days. Eating in the garden and sitting under the star filled sky. What more could we want . We lived in Suffolk and being in the Suffolk Constabulary it was great to head for the Dordogne, known for the weather and culinary delights. The house is well equipped , spacious and comfortable. During the hot summers there is the fun pool for a quick dip, and the house remains cool. La Grosse Forge is in a small village the Doctor, Pharmacy,Vet, and supermarket are 5 mins by car. It's ideally located to go in all directions. During the summer there are activities all around us. Night food markets with music and food stalls. the kitchen is fully equipped with all crockery,glasses and pots and pan. The kitchen is large and has a farmhouse table which seats 6 people, more chairs are available. A great garden with all garden furniture, loungers, parasols. Table and chairs. A Fun Pool, above ground. A charming place to relax for families, friends and couples. 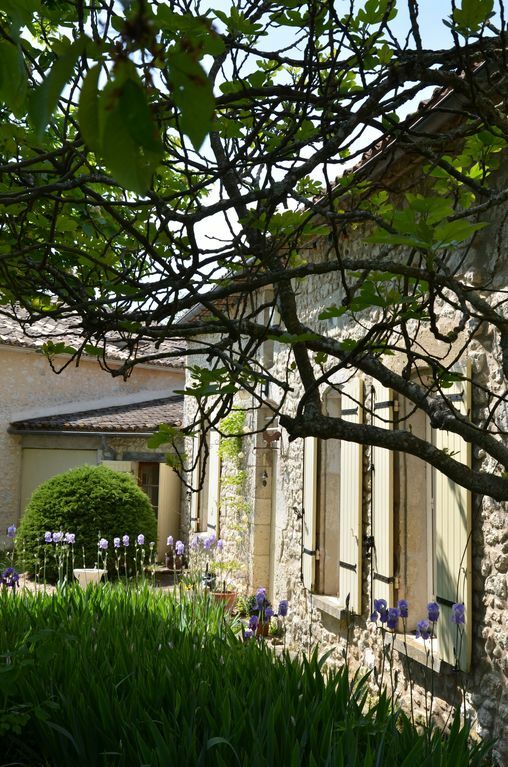 The home provided everything we needed for a peaceful, relaxing vacation in southern France. Clive and Jane were very attentive and lived on a nearby property to provide us with any help we needed. His garden vegetables were an added bonus! The Night Markets are a great way to spend an evening, eating local dishes and tasting local wines, with various entertainment. The surrounding vineyards offer the chance to taste the stunning wines of the area. Restaurants provide wonderful menus at very reasonable prices. If you are looking to relax and get away from it all, the ability to walk or cycle through the countryside at your own pace. The local Lake with fantastic amenities , free canoeing , play area and secure swimming . Don't miss out on visiting Bergerac and use the tram to visit Bordeaux. Stop and watch the world go by at one of the weekly markets. You can canoe down the river Dordogne, take a picnic make a day of it. Well behaved pets are allowed. Please advise prior to booking.